Although I’m likely ahead of the curve, I’m a believer that wearable displays and smart wristwatches are poised to become mainstream sooner rather than later. More devices are gaining connectivity: 50 billion are expected by 2020, and they won’t all be smartphones, tablets or computers. Weeks ago, I put my money where my mouth is, bought a Sony Ericsson(s sne)(s eric) Live View wearable display, and found that it wasn’t ready to meet my needs. 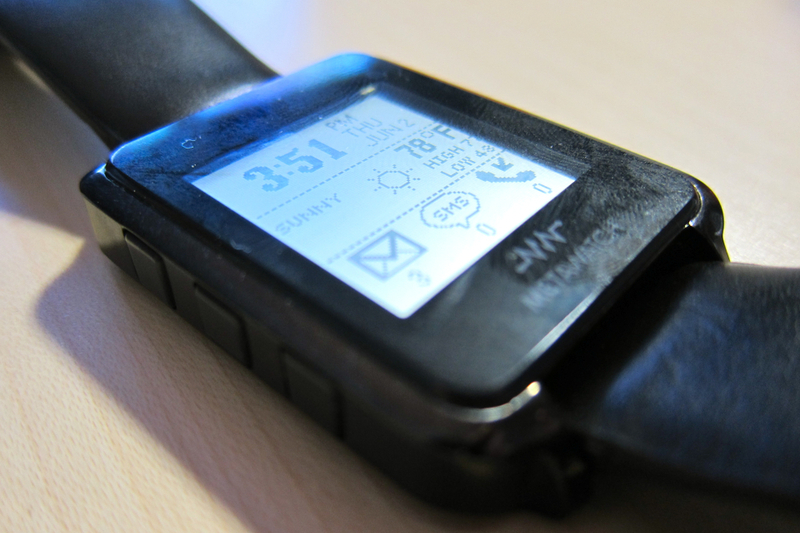 The watch-like device depends on a wireless connection from an Android smartphone to feed it information. In my use, I experienced frustrating connection drops several times an hour and faced endless tapping to scroll through information. My experience with the MetaWatch, a prototype watch project backed by Fossil (s fosl), couldn’t be any more different. The reason is because the MetaWatch takes a different approach, which I’ve come to see is more effective. Instead of trying to cram extensive application functions into a small screen on the wrist, the MetaWatch offers useful information at a glance without the need for scrolling. MetaWatch isn’t trying to replicate or replace smartphone functions; it supplements them. And the connection is rock-solid and reconnects by itself. Bill Geiser, VP of Watch Technology, and David Rosales, manager of product development and engineering, both from Fossil, recently told me the watch is an exploration for the company. “Some may overlook the convenience, which to us is a feature. Think of Netflix (s nflx) and microwaves: each takes an existing concept and makes it easier to use, for example,” Geiser said. A perfect example of that convenience is how I’ve used the MetaWatch to help me triage the near-constant flow of email coming to my phone. When a message arrives on my handset, the MetaWatch vibrates two times as an alert. That tells me some type of message is about to appear on my wrist. A few seconds later, the watch vibrates once and shows the sender’s name, subject line and a few words of the email. That’s all I get, but I’ve learned that’s all I need. From that one glance of minimal information, I can tell if the mail is important enough to pull out my smartphone (cat videos can wait) and take action or if I can simply ignore the message until I have more time later in the day. It doesn’t sound like an earth-shattering change, but after two weeks with the MetaWatch, I find it an effective time-saver. The alternative is taking out the smartphone with every notification, unlocking the device and then scanning the email, which may not even warrant immediate action; a much more disruptive activity. This same at-a-glance functionality works with incoming text messages, incoming phone calls and calendar event notifications. The watch face can also show local weather, and of course, the time and date, in addition to the number of unread emails, messages and missed phone calls. The current music track and artist can also be shown, although on the prototype, that function hasn’t worked for me. The “secret sauce” behind what the MetaWatch displays is actually an open-source solution, aptly named OpenWatch. I’m using the software on my Android handset, but it supports other platforms as well: BlackBerry (s rimm), Windows Mobile (s msft) and Java (s orcl) handsets, for example. The MetaWatch pairs quickly with the OpenWatch software using Bluetooth, and the wireless range itself is far better than what I experienced with the Sony Ericsson Live View. In contrast, I’ve worn the MetaWatch at least 80 feet from my handset and still received notifications. That’s likely due to both the software as well as the low-power Bluetooth solution used in the MetaWatch, which is a wireless chip from Texas Instruments (s txn). As a reminder, this is a $200 prototype for developers and other watch manufacturers to leverage so don’t get hung up on size, form factor and other physical features. The device uses a 96 x 96 reflective display, has six function buttons, backlight capability, vibrating motor, leather strap, accelerometer and rechargeable battery. The beta software I’m using is specific to stress test the messaging, so it hits the battery harder than a production version would. I was told to expect a day per charge and I can easily see that. With final software, the watch should run for a full week. Developers can instrument their applications to leverage the MetaWatch with very little code; since the device is essentially a remote display, applications simply need to provide output to the MetaWatch through the OpenWatch software. And that’s partially why Fossil is backing the project as a platform, instead of driving their own individual sales. “We think there are 1,000 killer apps for this,” Rosales said, and by licensing the effort, Fossil stands to gain back the last few years of effort and research dollars to pair a smart watch on the wrist to nearly every smartphone out there. My conversation with Geiser and Rosales and the last few weeks of using a MetaWatch, have taught me that the MetaWatch team “gets it” when it comes to smart watches. There are many visions of what a smart watch ought to do, but the more functionality added, the more complex and disruptive the technology can be. Perhaps one day we’ll all be talking into our wrist for a phone call, but for the coming future, a display-at-a-glance device with a simple, intuitive interface is saving me much time. I don’t see it succeeding. The days of wearing an information device, primitive or elaborate, are long gone. Why chafe your skin with a thrall collar when the average person is willing to enslave themselves to a physically separate mobile device anyway? What about the iPod Nano paired with a watchband like the TikTok? Could be a viable contender as soon as it starts running apps, especially if it can talk to an iPhone via Bluetooth. The App Store is a much shorter path to market for software developers than trying to get pre-installed in a Fossil watch. That’s certainly an option, but it wouldn’t be any easier for devs to get on the Nano. There aren’t any apps to install on the MetaWatch. A dev simply needs to instrument their existing app to output data to MetaWatch. I’d like to challenge you a bit here. Back when you first started talking about taking an interest in the watch realm I remember you saying (could remember wrong or confuse it with another device you cited) that Sony-Ericsson had some attempted watches back in the MBW-150 era, but it just wan’t there yet. It didn’t do enough. It was only a sentence or two but that was the impression I walked away with. Now what you are saying is that the watch actually does not have to do much. Well, I was wary of the MBW-150 specifically because it did not appear to have the wonderful functionality (on paper) of the LiveView. But I figured, there are occasions I just cannot wear a LiveView. So I found and picked up a used MBW-150 Executive figuring I might just have to wear it on those occasions. I also very much like that it is a regular watch at first glance and won’t attract too much attention. Here’s an Amazon link for the generic. You can find them cheaper on ebay. Kevin. Give one of these (either the generic or the Sony-Ericsson) a try. Tell us if it is able to provide the goods you describe above without the flash. It works for me doing what you describe above. Levi – great comment and challenge! :) I’m *fairly* certain that I wasn’t speaking about the MBW-150 in prior conversation, but can’t be sure. I don’t see anything wrong with the device – in fact, the Fossil folks and I spoke about that very watch quite a bit during our MetaWatch conversation because they worked with SE on the watch. SE decided to go it alone with the Live View and based on my experience, that may have been a mistake for technical and UI reasons. That’s just my opinion, of course. I’ve also learned that “less is more”: what I thought I wanted a watch to do may have been too much, so in that regard, my expectations have been tempered. As I look at the MBW-150, I see much to like as you’re right: there is very similar functionality there. And the device looks like a traditional watch. Personally, I stopped wearing a watch about 5 years ago so I don’t mind if my watch doesn’t look traditional. I’d rather have the larger display of a MetaWatch because I can see more information at a single glance; the MBW-150 has a much smaller display, so you see less information at a glance. The full-face of a MetaWatch could bring more developer opportunities. Again, just opinion and personal preference because it sounds like the watch is meeting your needs, which is great! I think you nailed one point I was trying to make, when you said “I was wary of the MBW-150 specifically because it did not appear to have the wonderful functionality (on paper) of the LiveView.” Too much functionality can actually make the experience worse as you have to tap and scroll through different screens to get at that functionality. A minimalist view might be better in this case. I’m with you in the perception that wearable computing will become another useful avenue for technology, especially as we move into different materials and contextualized uses of current mobile devices. As with the SPOT watch concept, this is a good start, and at least begins with a behavior that is familiar to certain generations/cultures of life’s users. That said, there’s a place to extend the mobile to one’s wrist. And maybe power and wireless abilities will make the watch phone a simple and usable concept that is as durable/flexible as the watch-timepiece has been. But it will have to first meet fashion, not functionality. It can’t look like a computer on your wrist, no matter how much it does.